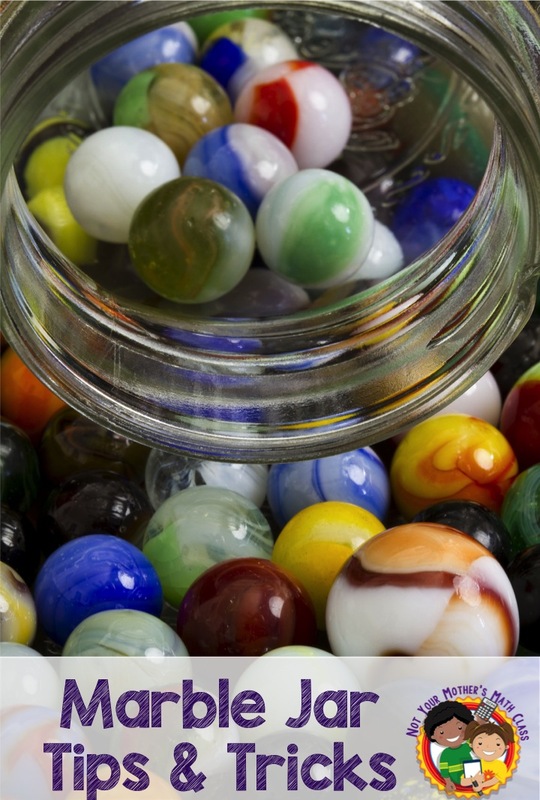 The marble jar is a traditional but effective classroom management tool. Individual rewards are great and I think they should be used. Group accountability is also necessary to improve teamwork and support a class identity. Several of my teachers had marble jars (or equivalents) and as a teacher I have frequently used a marble jar. I remember my fourth grade teacher actually had a peanut jar where she put peanuts when we were good (the kind in shells) instead of marbles. We would collect enough peanuts in order to win extra recess time. It wasn't just the recess time that kept us in check but the recognition of our good behavior by earning a peanut helped to keep us on track. I think my sixth grade teacher could have used one. I went to a K-6 elementary school. My 6th grade class had a difficult time finding a positive identity and I think that team accountability would have helped. If you don't teach a K-5 homeroom, don't think that marble jars aren't for you. I've seen them successfully used in special area and in grade levels that switch classes. Make sure to use your jar frequently, it is important for students to anticipate the probability of earning a marble. If you don't use it for weeks, students will forget about it. Make it a class effort. After a day, class period or other designated time allow students to explain why the class deserves marbles - lining up quietly, cleaning up quickly etc.. This makes students more accountable and aware of their behavior. It also encourages students to speak in front of the class and explain their thinking. Keep the clink. Some teachers use pom poms or other quiet items instead of marbles. I love the clink of marbles. If students are all working quietly, I can drop a marble or two in the jar; students hear it and know they are being rewarded but it does not pull them off track. Make the size of your marble jar attainable. If you have a gallon size jar, students will become discouraged with the amount of time it will take to fill it. Make rewards fit the size of the jar. If your students are old enough to understand delaying gratification, allow them to vote on accepting a smaller award for filling a cup or to save up for a larger reward by continuing to collect marbles to fill up a pint. This can be a good lesson in capacity and democracy. Make your marble jar part of your math lesson. Estimation Jar - have students estimate how many marbles it will take to fill the jar. When it is full, give a prize to the student(s) who estimated the closest. Capacity - have students begin by filling a cup. Pour it into a pint, then add the next cup. Continue to show cups, pints, quarts and gallons. Addition - keep track of how many marbles are earned each day or week. Add the day or weeks marble to the previously earned amount to find a total. Do you have a marble jar in your class? What are your favorite ways to use it? Please leave a comment below.